As part of the deal between Forterra and Weyerhaeuser, 60 acres of forest close to the trail are being logged and the trail is closed until July. When it reopens, there will be a buffer of trees between it and the logging site, and “will still look much like it did last summer,” says Forterra’s forest conservation director, Charles Raines. Park near the trailhead off U.S. Highway 2 and hike 1.7 miles through lush second-growth forest—look for abundant salmonberries lining the trail—to a fork where you can detour to Bridal Veil Falls. The waterfall thunders down 1,000 vertical feet over five sections and is sure to spray all who venture near. Once you’ve soaked in these heavenly mists, retrace your steps back to the main trail. The thigh burning begins here as you traverse switchback after switchback for another 1.5 miles, gaining 1,300 feet in elevation. 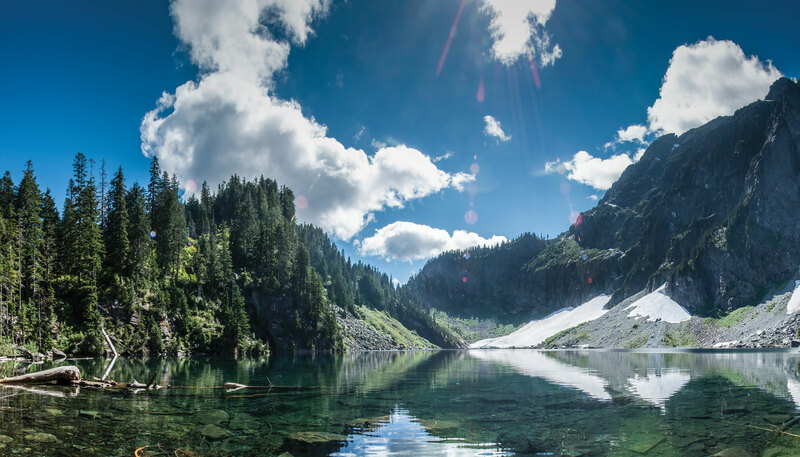 The trail levels off and delivers you to the calm and tranquil shoreline of Lake Serene in a glacial cirque below the imposing peak of Mount Index. If you’re hot enough after the ascent, you may just want to dive right in. Otherwise, spread out your picnic lunch and revel in the Cascadian splendor surrounding you. Trail to Lake Serene reopens in July.